1. Archbishop Alexander BURNET, son of James BURNET ( - ) and Christian DUNDAS ( - ), was born in 1614. He was a Clergyman. He died in 1684. He was buried in St Salvator's Chapel. He married Elizabeth FLEMING. 2. James BURNET, son of William BURNET of Barns and Margaret STEWART, was a Clergyman. He appeared in the census. He appeared in the census. He celebrated his Bar Mitzvah. He married Christian DUNDAS. James, graduated from the College of Edinburgh in 1609 and was Minister of of Lauder from 1615, and inducted as Minister of Jedburgh by Charles 1 in 1635. He was deposed for his episcopalian views in April 1639. 4. William BURNET of Barns, son of unk BURNET, was born circa 1546. He died circa 1653. He married Margaret STEWART. William Burnet of Barns, born about 1546 in the parish of Manor in Tweedale became perhaps the most famous of the branch. He was known as the "Hoolet of Barns", due most likely to his keenness of sight. He is said to have been of great stature and great bodily strength and lived to the ripe old age of 107. Burnet was a notorious border raider; nonetheless, several of his sons entered and were successful in the legal profession. He bore the nickname the ‘Howlet of Barns' on account of his sagacity in conducting midnight expeditions and was apparently a ‘staunch cavalier…well horsed, with a buff coat and steel bonnet, lance and sword? Clearly enough the relationship between the Veitches and the Burnets - their neighbours on the east - was that of close friendship through the centuries. They had had foes on the west in those of the name of Tweedy, Crichton, and Porteous. The Veitches had usually for their allies besides the Burnets, Geddes of Rachan, a very old family, with which they had intermarried. It is now extinct, but it gave us, in the last century, the cultured Cambridge scholar - prematurely cut off - James Geddes, the author of An Essay on the Composition and Manner of Writing of the Ancients, particularly Plato. They had also for allies occasionally the Lord Fleming of Biggar and Cumbernauld, as is witnessed by a bond of man-rent between William Veitch and the Lord Fleming (22nd November 1531). This was a £4 10s. land (260 acres), and lay to the west of the village of Broughton and alongside Biggar Water. There is no doubt that it was the earliest known possession of the family of Burnet of Burnetland, afterwards of Barns, a detailed account of which is given in the chapter on the parish of Manor. In the Roll of Battle Abbey there appears among the followers of the Conqueror the name de Barneville or Burneville, and it is supposed that he is the ancestor of the family, but of this there is no evidence. The earliest record of the name in Scotland is the charter of foundation of the Abbey of Selkirk by Earl David, afterwards King David I., to which with others Robertus de Burnetvilla, miles, is a witness. This charter was granted prior to 1128. The same name, but spelt Burneville, according to the Norman-French of the time, appears among the list of hostages sent into England for the ransom of King William the Lion, who was captured at the battle of Alnwick in 1174. Nisbet in his Heraldry accepts the two names as of the same family. 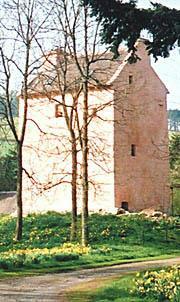 For almost two centuries there is no further trace, and then on 24th May, 1367, in the reign of King Robert II., Robert de Burneville and his son Robert appear as witnesses to a charter by Patrick de Dunbar, first Earl of March, to the monastery of Coldingham; and in 1390 Rodbertus or Robertus de Burneville is a witness to a charter on 5th April by King Robert III. confirming a previous charter by King David I. to the monastery of Holyrood. After that there is no further record of the family of de Burneville, and it is not till 1476 that we come on the first authentic ancestor of the Burnets - John Burnet of that Ilk. It is not unlikely that John Burnet was kin to the de Burnevilles, Nisbet and other genealogists thought he was, although, apart from the similarity of the name, there does not appear to be anything in the nature of satisfactory evidence. But there is nothing whatever to show that any de Burnetvilla or de Burneville ever held the lands of Burnet-land in Broughton. Their territorial designation, which prior to the fifteenth century took the place of a surname, goes back to the beginning of the twelfth century - earlier if we accept the entry in the Roll of Battle Abbey - and was evidently taken from lands which the family had originally held in Normandy. Certainly the designation was not derived from Burnetland, for it was part of the barony of Broughton, and the proprietor was a vassal of the holder of the barony, and the barony itself was not in existence till the fourteenth century. It is of course, possible that a de Burnetvilla purchased the lands from the Haldanes or the Mowats and gave his own designation to them. But it is not likely, and, apart from there being no records to indicate such a transaction, there is a significant fact which practically destroys that theory. All the de Burnetvillas or de Burnevilles that we know of had Robert for their Christian name. The first Burnet of Burnetland was called John. More than that none of the subsequent proprietors of Burnetland and Barns was called Robert. The prevailing Christian names are John and James, and we do not meet a Robert Burnet - he was, a younger, son of the 'Hoolet' - till the latter part of the seventeenth century. Accordingly, it may be assumed that John Burnet referred to in 1476 (or his, father) was the first owner of Burnetland, and that he gave his name to it. The Christian name of John Burnet's father - he died before 1470 - is not known, but he married Marion Caverhill, and through that marriage the family acquired the lands of Barns in Manor from which afterwards they took their designation. John Burnet was a witness in 1476 to the fixing of the boundaries of Kailzie, and in 1479 was on a jury at Peebles for the service of heirs. In 1484 he was on the inquisition at Peebles which found that the burgh was entitled to the pasturage of Cademuir. About 1493 he was on the jury for the service of Thomas Lowis in Harcus. Further particulars of him are given elsewhere. He was twice married, and died in 1502, succeeded by his son William. At his death he was proprietor of only one-half of Burnetland, but when the other half had been disposed of there is no record to show. From his half, his widow claimed her terce, to which she was 'kenned' on 15th February, 1502-3. William Burnet was a minor when he succeeded his father, and particulars of him will be found elsewhere. He took the designation 'of Barns,' but he had also his father's share of Burnetland, and it is evidently he who is referred to in a memorial prepared about 1652, a fragment of which is among the Barns Papers as having fought at the battle of Pinkie in 1547 and been wounded. He died in 1564, and as Burnetland does not afterwards appear as a possession of the Burnet family, it may be assumed that he sold it before his death. The two halves of Burnetland, although referred to in the titles as such, were not equal. One was a 50s. land (156 acres), and the other a 40s. (104 acres). It was probably the former which William Burnet sold.